This is the first in a 3-part series of articles on the Tongva people by Cindy Hardin, LA Audubon Ballona Wetlands Education Program Coordinator, and Jane Beseda, Director at Large, Santa Monica Bay Audubon Society. 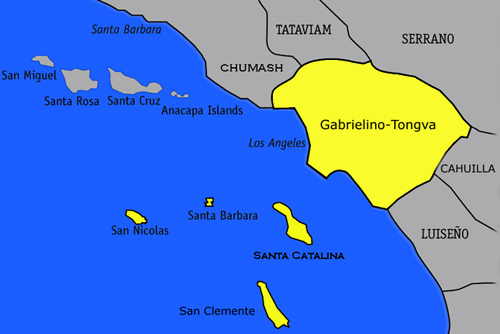 Territory of the Tongva people. The Tongva inhabited the Greater Los Angeles area as far east as the base of Mount Wilson, 40 miles inland. Their territory was bounded by Malibu to the north and Laguna Beach to the south. They also occupied some of the Channel Islands, including Santa Catalina, San Clemente and San Nicolas. You can still hear their language in place names such as Pacoima, Tujunga, Topanga, Azusa, Cahuenga, and Cucamonga. The Tongva’s appearance and costume were distinctive. The people were somewhat short and sturdy by European standards. They were also lighter-skinned than the indigenous people further to the south in Mexico and Central America. They had brown or reddish hair, and no baldness. The Tongva washed their hair with urine to kill lice, and this practice might have accounted for their light hair color. Some Spanish explorers wrote of them as the “blonde” people of the area. The women used red ochre, a type of clay that is heavy in iron, as sunscreen. Hair and clothing shown in display of trade goods. Women wore their hair loose and long. The men also wore their hair long, but wound the top part into a bun, fastened with pins of bone or wood. Only the men wore hairpins, as this was done to keep the hair out of their eyes when hunting or fishing. 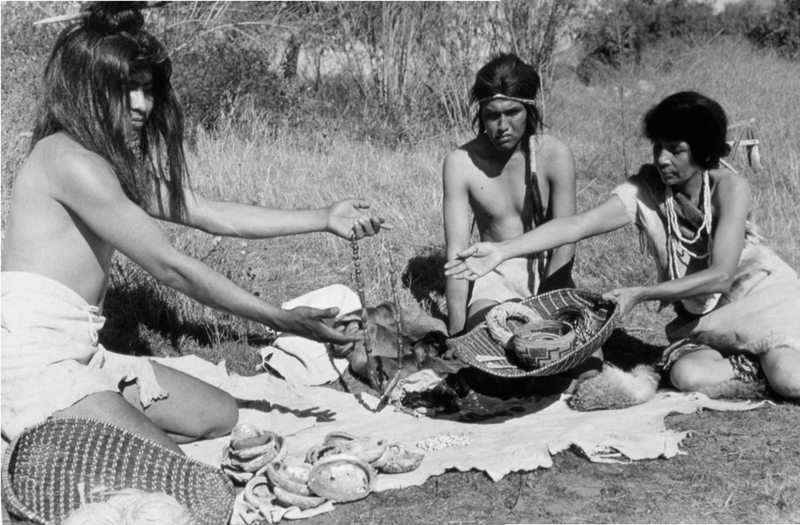 Women wore knee-length skirts or front-and-back aprons of skins, grasses, shredded bark or strings made from yucca fiber. During the warmer months, men went naked or wore loin cloths, and the children wore no clothing. During cooler months, the Tongva wore garments and wraps of animal skins, often made of rabbit. All went barefoot except when traveling in cactus country or rough mountain areas. 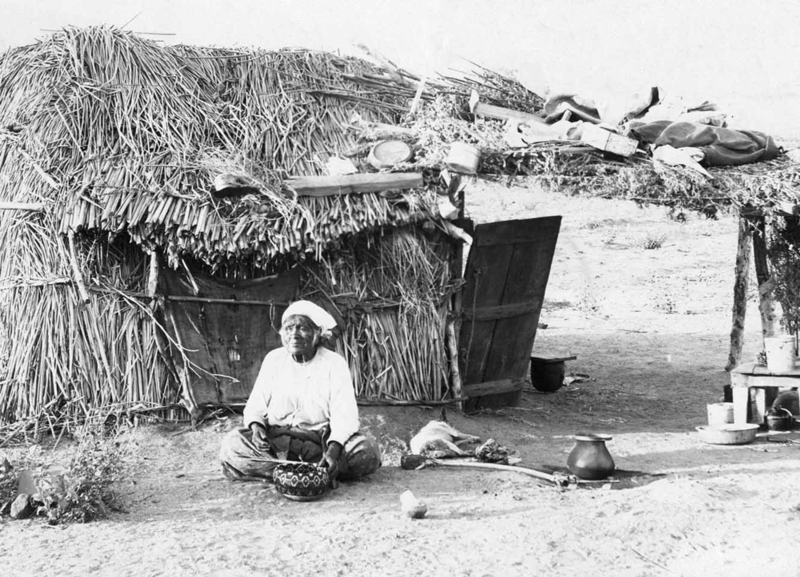 Tongva woman at her shelter covered with tule mats on the banks of Los Angeles River. The Ballona village site of Sa’angna, is formally designated as Area CA-LAN-62. The actual location is believed to have been east of the saltmarsh along the base of the Westchester bluffs in what is now Playa Vista. At that time, Centinela Creek flowed freely and was a source of fresh water for the settlement. The village of about 100 people was approximately 1500 feet long and consisted of several clusters of 4 to 5 houses, or kiiy (pronounced “key”), spaced 15-20 feet apart. (Spelling variants include ki, pronounced “key,” and kich, pronounced “kish.”) These houses, which the Spanish called jacals, served mainly as sleeping quarters for an extended family. The kiiy were dome-shaped and framed with bent poles. The branches of the Arroyo Willow, which is still abundant at Ballona, were used to make the frame. Tule grass, a type of bulrush found in freshwater habitats, was dried and used to cover the frame. Tules were also dried and woven together to serve as floormats inside the kiiy. A hole at the top of the dwelling let out the smoke from a fireplace in the center of the structure. The replica of a kiiy located at the entrance to Ballona wetlands is much smaller than the actual kiiy used by the Tongva, which were 3 to 4 times larger and served as sleeping quarters for an extended family. The Tongva were a friendly tribe, paddling out to greet the first Spanish ships with gifts of nuts, berries, acorns, and seafood. Conflict between villages over failure in gift-giving at ceremonies, abduction of women, poaching and trespassing, or hurtful sorcery sometimes resulted in war. But the decision to go to war was taken very seriously, and all members of the community were involved. Most conflicts were resolved by “song fights,” the days-long singing of insulting songs in vile language, accompanied by much stamping and tramping of the ground. (Redrawn image by Sue Ann Sinay, after Miller, 199). Tongva pictographs are very rare today, having been destroyed by the development of Greater Los Angeles. There are paintings at a few sites in the San Gabriel Mountains and in the northwestern part of the San Fernando Valley, but none are public. A replica of their rock art is on display at The Southwest Museum. The purpose and function of Tongva pictographs may have been similar to that of the Luiseno, since both have diamond patterns and wavy lines. Luiseno boys and girls painted with red hematite on rocks during their puberty ceremony. During the ceremonies, sand paintings were created to illustrate the Luiseno conception of the universe, the night sky, sacred beings, and the spiritual component of the human personality. At the end of the ceremony, the sand paintings were destroyed, and girls raced to a rock where they painted angular and diamond shaped designs. Perhaps the young Tongva women also painted these symbols during their puberty ceremony. I enjoyed your article. If only modern day Los Angelenos stomped their feet and sang angry songs in response to wrong doing, and everyone kindly greeted newcomers with fruits and nuts to make them feel welcome. Tongva seem like people I’d like to have known.